Sweden is a beautiful country with so much to offer. Culture, food and beautiful sights are everywhere, from the well-known Northern Lights to all the different restaurants that have left so many people leaving happy and well-fed. Stockholm, the city’s capital, says: “We are welcoming dissidents, people we admire, those we can’t understand, the friendly, the disorderly and the well-behaved.” Everybody is welcome at Stockholm. West Sweden is known for its magnificent food that it serves there in many different restaurants all over the region. Food bloggers and world-class critics alike visit West Sweden for its range of restaurants and hospitality towards any tourists who want to try their enormous range of foods, from the Fish Church in Gothenburg to the Feskekyrka food market and restaurant. Gamla Stan is the old town of Stockholm, Sweden. Gamla Stan mainly consists of the island Stadsholmen, but it also has three little islets named Riddarholmen, Helgeandsholmen, and Strömsborg. It is the place where Stockholm Palace is located, the main residence of the Swedish Monarch King Carl XVI Gustaf and Queen Silvia. There is also the Museum of Medieval Stockholm, which allows its visitors to experience medieval Sweden with its brick houses, workshops and even its harbour. Stockholm Palace was built in mid 18th century, with a whopping 1430 rooms and 660 that have windows. There are several museums in Stockholm Palace, all of which you can visit, including the Livrustkammaren, Gustav III’s Museum of Antiquities, The Treasury and The Tre Kronor Museum. In the Stockholm Palace, you can also see the changing of the Royal Guards ceremony take place, with approximately 800,000 people watching each year. To finish it all off, you can visit the Royal Gift Shop with many different souvenirs and trinkets on sale as well as a wide range of books. Skansen is the first open-air museum and zoo in Sweden, located on the island Djurgården which is also home to many other historical monuments and amusement parks. Skansen has over 1.3 million visitors each year, coming for the many different exhibits including a full replica of a 19th-century town with people living their daily lives as they would during the 19th century. The zoo contains many different Scandinavian animals including bison, brown bears, seals, and even reindeer as well as numerous others. The site’s central square is a Christmas market which is visited by roughly 25,000 people each weekend during Christmas time. In the summer there is folk dancing and concerts. Stockholm City Hall is one of Sweden’s most popular tourist attractions and for good reason. It is located on Kungsholmen Island, and in it, you will find the conference and ceremonial halls, and a luxury restaurant, Stadshuskällaren. This restaurant has dishes based on the wildlife of the north via the west coast’s fish and seafood, including a massive range of different desserts. Gröna Lund is located in Stockholm, with over 30 different rides and amusements available for children and adults alike, with the slowest roller-coaster going 26kmph and the fastest going almost 100kmph. There are bumper cars for the young kids, and children from 0-3 can ride for free along with a full paying adult. Gröna Lund also has several concerts going on, especially during the summer, with a wide range of different artists performing yearly. Holidays can be expensive. Paying for a whole family of four or even just going by yourself can cost thousands of pounds, especially when you are going somewhere popular such as New York or Paris. Travel costs, food costs, the fact that you need somewhere to sleep… Sometimes you just need an affordable and relaxing getaway to put the daily stress of life on hold. Whether you want to travel to visit the beach or to eat the best street food there is to offer, going on a budget holiday is the best way to satisfy your urge for something different. Cuba is a brilliant place to visit for all the family or just solo. This Caribbean island is also one of the cheapest places you can visit- with prices of several hotels being less than £50 a day. You can visit Viñales Valley for a bike ride or hike up this mountain which is also a world heritage site. There are also several different museums such as the Museum Of the Revolution and Havana is well-known for its bustling nightlife. Whether you’re going by yourself or not, Cuba is a great place to visit at very cheap prices. Even though Greece is undergoing an economic crisis as of now it is still a very good holiday destination, especially when on a budget. The prices are budget, and the population is always appreciative of tourists who visit to support their lives whether it’s by buying food from a restaurant or staying in their hotels. Greece is an idyllic place with thousands of different entertaining things you can do, such as visiting the classic Acropolis in Athens or going to the world-renowned Parthenon which is thousands of years old. Greece has some of the best Mediterranean food in the world, and it’s all very cheap and affordable. Bolivia is the cheapest country to visit in South America. It is filled with different types of attractions to visit, including various mountains such as the Andres Mountains that are perfect for hiking, as well as the Amazon Basin Rainforest that is a place of exploration. The Lake Titicaca is the largest lake in the continent, and it is a great place to go kayaking or even to just look at. The lake is also home to Incan ruins and a large range of wildlife such as llamas, alpacas, or just frogs. Hotels in Bolivia can be as cheap as £100 a night, and there is really no better place to go if you are an adventurous person. The main reason most people visit Shanghai is undoubtedly because of the large amount of amazing street food on offer, from soup dumplings to sticky rice balls. There are a few places with cheap accommodation, and even if wandering the busy streets of Shanghai is not for you, there is also places like the Yu Garden or the Oriental Pearl Tower where you can sightsee or just relax. For the kids or avid Disney fans, there’s also the Shanghai Disney Resort which is always a crowd pleaser even though it isn’t the cheapest option on the list. Portugal has always been known for being one of the most affordable options in Europe, with dozens of different medieval buildings and towers still available to view. The Belém Tower, Castle of the Moors and Jerónimos Monastery are some of the most popular medieval landmarks. Of course, if you do not enjoy medieval buildings or history, there is always the option to just visit the Peneda-Gerês National Park, a beautiful nature reserve with many different walking trails suitable for all the family. Portugal’s flights are cheap and hotels start at the low price of only £12. Posted in Where To Go On Holiday? | | Comments Off on Top Five Places to Visit Glasgow, Scotland. Posted in Hotels	| | Comments Off on Wholesale Hotels Group is disrupting a $500-billion-dollar online hotel booking industry! Located in the downtown area of the capital city of Georgia, USA is the Georgia Aquarium. This internationally recognized aquarium is home to over 100,000 animals and many species of fish and sea creatures. It is the second largest aquarium in the world. This public aquarium has been built by the generous contributions of individuals such as Bernard Marcus, Jeff Swanagan, the Coca-Cola company, and others. It was originally built around the establishment of a home for whale sharks and from that has grown a location with educational programs, public entertainment venues, and seven different exhibitions that are updated yearly to reflect the most recent combination of sea life. Visitors may view seven different exhibits. Southern Company River Scout is an exhibit that shows local area and regional underwater environments to be seen from the bottom up. The AT&T Dolphin Celebration comes complete with a dolphin show from the 13 dolphins in residence. Cold Water Quest exhibit allows the public to see animals from the polar regions of the world. Ocean Voyager was built by Home Depot and shows life from the Mesoamerican Barrier Reef System. The Tropical Diver exhibit shows Indo-Pacific fish and the development of live coral reefs. Suntrust Pier is an exhibit of sea lions. Aquanaut Adventure: A Discovery Zone is the most recently built aquarium and features a scavenger hunt using the aquarium’s mobile app. Included in the offerings is also a Titanic Aquatic that has a walk-through of the original Titanic ship. The aquarium is open to the public year round. Located in Midtown Atlanta on Peachtree St. is the Fox Theatre, known as the “Fabulous Fox.” It was originally a Moorish temple and eventually a movie palace. It has been restored to be the most active venue for national and international performing companies and stars. Broadway touring companies may be seen at the Fox along with the Atlanta Ballet Company and many award winning films from around the world. Make sure you hear and see “Mighty Mo” the Fox’s 3,662 pipe, theatre organ that still ranks as the second largest pipe organ in the United States. It has been featured in many live productions and Hollywood movies. Midtown Atlanta, Georgia is home to the 30 acre botanical garden started in 1976. It is designed to provide aesthetic, educational, recreational and dining experiences for the general public. It involves itself in conservation and research in order to continue growing species of plant life native to this area of the world. The garden is home to the Children’s Garden, the Fuqua Conservatory, and the Fuqua Orchid Center. Social events, weddings, art exhibitions and the annual Garden of the Eden Ball are held in these locations. Of special interest during the winter season is the Garden Lights, Holiday Nights exhibition which features 1.5 million LEDs. If you fancy a walk in a beautiful park, long to get your oils out and paint, or simply desire to listen to an outdoor concert, it can happen in Piedmont Park. This urban park was originally a gentleman’s farm, but was sold to the Piedmont Driving Club to be used as a racing grounds. The Driving Club joined arms and money with the Piedmont Exposition Company and began to use the property as a place for fairs and expositions. In the 19th century, major expositions were held at this location and eventually the designer of Central Park in New York City was engaged to redesign the land to be more user friendly for the local population. Walking paths, benches, and places of repose were created and the park began to be a more common place for the general population to come. In addition to a place of beauty and recreation, many outdoor concerts featuring national and international stars are held in the park. Known worldwide as the leader of the American Civil Rights Movement, this location was very recently renamed the Martin Luther King Jr. National Historic Park. It is home to the home of his birth and Ebenezer Baptist Church from which is preached and pastored. The MLK site consists of a museum that showcases exhibits about the civil rights movement and Dr. King’s role in this movement. There is a gift shop built inside what was originally a fire station. The center is also home to the “I Have a Dream” International World Peace Rose Garden and a statue may be seen dedicated to Mohanda K Gandhi. Visitors may also walk along the International Civil Rights Walk of Fame. Special events are held during Black History Month which is February and every anniversary of the assassination of this great man of peace. India is well known for having one of the most prominent cultural histories, as well as it’s widespread religious beliefs. India is the second most populated country in the world, with over 1.2 billion people, and this means that there are thousands of different architectural feats, hundreds of different types of cuisine, and all different kinds of art. India is a wonderful place to visit as any tourist, and it’s no wonder that tourism in India is growing rapidly. (India received 23.3 million foreign and domestic tourists in 2016.) India has numerous different attractions to visit, including the iconic Taj Mahal, Gateway of India and the Lodi Gardens. Here are some of our favourite places to visit in India. The Taj Mahal is a world-renowned mausoleum that was commissioned in 1632 by the Emperor of the Mogul Empire, Shah Jahan, as a tomb to house his favourite wife, Mumtaz Mahal. 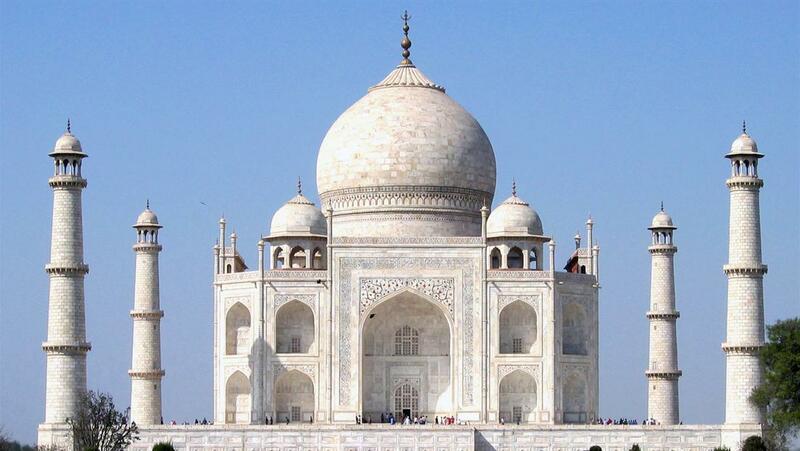 The Taj Mahal itself was built with glistening white marble and is a magnificent building to look at. The Taj Mahal is over 350 years old, and it is still one of India’s most celebrated structures, and the grounds compliment the fine scenery that you will see when you go there. The Taj Mahal is also a UNESCO world heritage site, so there are many tour guides to show you the Taj Mahal and allow you to experience the trip in its full. If you go to the Taj Mahal, the breathtaking building and wonderful insight from a tour guide into the building’s history will be well worth the visit, just make sure you bring sunglasses to prevent the glare from the white marble and the sunlight. 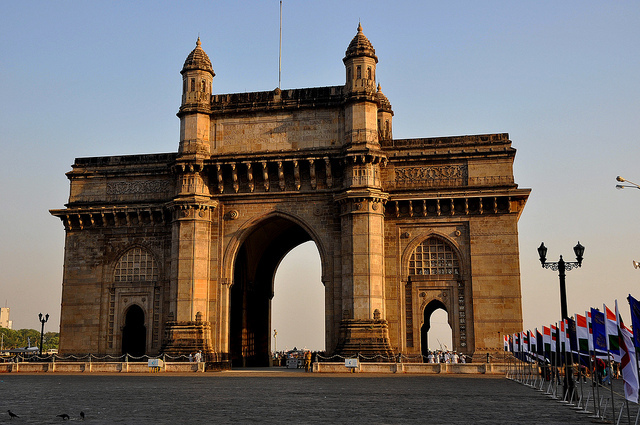 The Gateway of India is an arch monument that was built during the 20th century. It is located in Bombay, India, and it was erected to commemorate the landing of King George V and Queen Mary at Apollo Bunder on their visit to India in 1911 (although it was only completed in 1924.) This imposing archway incorporates Islamic-style architecture, and the basalt archway faces out to Mumbai Harbour from the top of the Apollo Bunder. The Gateway of India has been referred to as the “Taj Mahal of Mumbai”, and for good reason. You will definitely enjoy the beautiful view of the sea, stretching out in front of the iconic Taj Mahal Palace, (which is a hotel.) The Gateway of India is free of charge and has many good cafes and restaurants nearby. People flock together in the Gateway of India, and it is just a great place to visit, and a wonderful experience for anybody who enjoys fine architecture. The Lodhi Gardens is a park situated in New Delhi. Lodi Gardens are one of the pleasantest green spaces in Delhi, with hundreds of different types of flowers and trees that are labelled so tourists can recognise each one of them. Lodhi Gardens is spread over 90 acres, and it contains multiple different tombs, including the tomb of Sikander Lodi, (built in 1517 by his son) who was the second ruler of the Lodi Dynasty. The Lodhi Gardens is protected by the Archeological Survey of India, and the Lodhi Gardens is a hotspot for Delhites who are going for an early morning walk. It is a breathtaking garden of flowers that are in full bloom, and you would forget that you are in the middle of a city. If you are in New Delhi, the Lodhi Gardens is a place to go, relax, and just enjoy the peaceful atmosphere and mood. Jaisalmer Fort is situated in the city of Jaisalmer, in the Indian state of Rajasthan. The biggest landmark in the city believed to be one of the very few “living forts” in the world. Jaisalmer Fort is a former city, and for the better part of 800 years was the former city of Jaisalmer. There is still nearly 1/4th of the city’s population still living there. This is the second oldest fort in Rajasthan, built in 1156 AD by the Rajput Rawal. The fort has massive yellow sandstone walls, camouflaging the fort in the yellow desert. 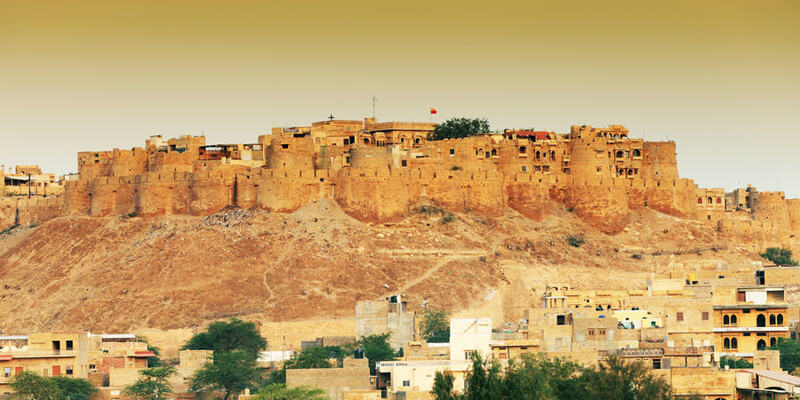 For this reason, Jaisalmer Fort is also known as “Golden Fort”. In 2013, at the 37th session of the World Heritage Committee, Jaisalmer Fort, along with 5 other forts of Rajasthan, was declared a UNESCO World Heritage Site. Jaisalmer Fort Jaisalmer fort looks utterly spectacular from the outside, and once you are within the walls of the fort it continues to shine. Beautifully preserved and full of shops, dwellings, restaurants and accommodation you really get the feeling that you have stepped back in time wandering around the narrow alleyways. Mehrangarh also referred to as “Mehran Fort”, is located in Jodhpur, Rajasthan. It is one of the largest forts in India, and definitely one of the best preserved. Built around 1460 by Rao Jodha, this fort is situated 125 metres above the city and is enclosed by massive walls. A stunning and sprawling fort set on a hill that was really a royal home. The rooms inside the Mehrangarh Fort are converted to a museum which documents the rich history of the ‘Rathores’ elaborately in the form of paintings, attires, arms, etc. The museum is considered as one of the most well-stocked museums in Rajasthan.Your tour of the museum will take you into the private living arrangements of Indian Kings and their royal consorts and wives. The architecture is well preserved and intricate, and the museum’s pieces are well curated and tell an intimate story about the royal household. It is absolutely fascinating, and any history fans will absolutely love Mehran Fort. The river Ganges is one of the most well-known rivers in the world, being over 2500 km long and passing through India and Bangladesh. It is the third largest river by discharge, and millions of Indian people depend on it for their daily needs. Three towns holy to Hinduism, Haridwar, Prayah and Varanasi attract thousands of tourists and pilgrims to the River Ganges to take a dip in it. This is done because cleaning yourself in the river Ganges is believed to “cleanse oneself of sin and help attain salvation.” The rapids of the Ganges are very popular for river rafting, especially during the Summer months, and there are many beautiful walkways that go across the Ganges for the benefit of tourists. An ancient highway that connected kingdoms, its shores are lined with majestic palaces, historic battlegrounds, and remote villages that offer up a slice of Indian life you won’t find in the big cities. The River Ganges is great and you can even take a ride in a boat which will carry you around it and show you how the people in the villages near the Ganges live. Thank you for reading about our 6 favourite places to visit in India.